Wednesday, May 1, from 6 to 9 pm. Individual memberships paid between May 1 and June 30, 2019 start at $195 and will be good through June 30, 2020. Corporate memberships start at $700. Join AAF-Houston for our May luncheon. Super Bowls. World Series. NBA Finals. Final Fours. MLB All-Star game. NBA All-Star game. MLS All-Star game. Copa América Centenario. Gold Cup. When it comes to premier events, our city delivers. Now, we’re ready to show why we deserve to host the world’s most prestigious sporting event. Join us on May 15th to learn how our panel of experts plan on bringing the World Cup to Houston! We will be presenting the Tenth District ADDY Awards! This is Election Day for AAF-Houston, paper ballots will be accepted. If you did not have the chance to vote online, this will be your last opportunity to do so. CHAIRMAN-ELECT - Kelley Robinson, BrivicMedia, Inc.
VICE-CHAIRMAN - Joni Verdina, Ad Impressions, Inc.
Join AAF-Houston for our annual meeting. We will be presenting the AAF-H Local Service Awards. Join us at the 2019 AEFH Scholarship Awards Luncheon, where 20 deserving students from throughout the AAF Tenth District will be presented with hard-earned scholarships. Fortunate? You bet. Talented and hard working? Even more so. Come see for yourself. Please join us on Wednesday, March 20th, at The Junior League of Houston. The event will feature a Luncheon and Awards Presentation benefiting the work of AAF-Houston and its educational and scholarship programs. Don’t miss our special musical guest, Shake Russell and Ad2 Rising Star Award recipient, Natalie Harms. Meet Shake HERE. Get to know Natalie HERE. In Texas, and especially in Houston, the name Hobby is synonymous with commerce and culture -media and public service have been a part of the family’s legacy for more than a century, and a major airport and a performing arts center in our city both bear the Hobby name. Today, Paul William Hobby continues that legacy. Paul is Managing Partner and Chairman of Genesis Park LP. In that role, he has executed a number of successful communications and technology investments focused around energy, telecommunications and media, building a portfolio of new and traditional media investments and providing strategic consulting services to several traditional media companies that wish to transition towards new media. In 2016, an affiliate of Genesis Park purchased the revered Texas Monthly magazine. Founded in 1973 by Michael R. Levy, Texas Monthly had been a member of the Indianapolis-based Emmis Communications since 1998. As Chairman and Chief Executive Officer of Texas Monthly Inc., Paul Hobby made an immediate impact on the publication, which had already earned 13 National Magazine Awards while chronicling life in Texas for more than 4 decades. Since he began his stewardship, the magazine and website have undergone extensive redesign, and Texas Monthly has actively embraced change -employing podcasts, video and a robust social media presence, and adding unique events such as Texas Monthly Live and the Edge of Texas Festival. Paul has also served as Chairman of the Greater Houston Partnership, the Houston Branch of the Federal Reserve Bank of Dallas, the Texas General Services Commission, the Texas Ethics Commission and the Texas Business Hall of Fame. He holds a Bachelor of Arts in History from the University of Virginia and a JD from the University of Texas Law School. 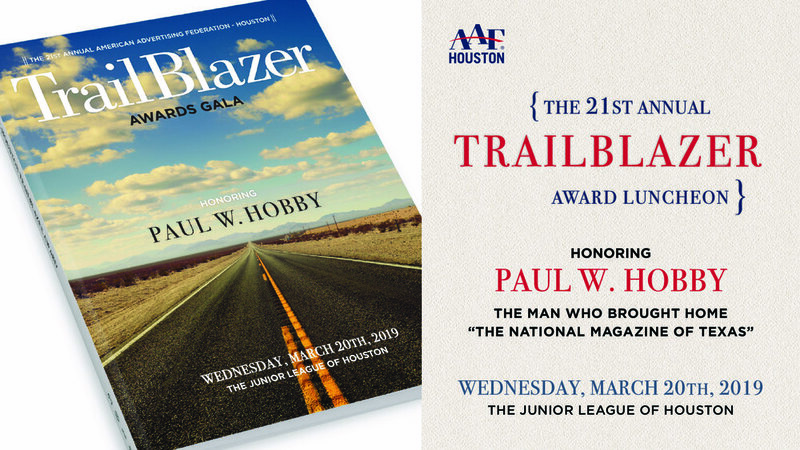 The Board of Directors and Members of the American Advertising Federation -Houston are proud to give Paul William Hobby our highest honor -the 2018 Trailblazer Award. Have you looked around lately? If so, you’ve probably noticed that your city is the beautifully most diverse in the nation – giving the country a glimpse of what the future looks like. And it’s important. It fuels the economy, directly impacts our very own advertising industry, and is the life blood of the culture of the city. Our goal is to dedicate the evening of March 6 to having an open dialogue about the nature of our uniqueness, our differences, and honor three local Houstonians who personify the idea of diversity and inclusion to move themselves – and their businesses – forward. This event will be held at Pitch 25, located in the heart of EaDo. We’re looking forward to providing a unique, truthful, and highly enjoyable for night for our guests! The event is FREE to all attendees! Please join us on Wednesday, March 6, for this special evening of recognition and celebration. Corporate Cupid - Attract the company you love! Join Ad 2 Houston for a night of “matchmaking” with your favorite local companies. For students, recent grads and communications professionals looking to build new relationships. Attendees will be paired up with interviewing experts or networking with professionals for 5 minutes before moving on. This is the perfect way to hone your interviewing skills or your elevator pitch. Be sure to bring resumes, portfolios and business cards! Corporate Cupid is a fun way to be introduced to opportunities in the Houston area. Students and recent graduates, only $10! February Luncheon - An Inside Look at the Houston Livestock Show and Rodeo with Lisa Gagnon. An Inside Look at the Houston Livestock Show and Rodeo with Lisa Gagnon. Join AAF-H for our February 20th luncheon. An intimate conversation with Lisa Gagnon, who oversees marketing for the Houston Livestock Show and Rodeo. Get an inside look at how they continue to evolve a brand bigger than Texas, and the fascinating ways they've wrangled new research and advertising to rope in new audiences. Feel free to dress in your best western attire to make her feel right at home! Join us for the 57th edition of Houston's American Advertising Awards, as we recognize and reward the creative spirit of excellence in the art of advertising. The American Advertising Awards, formerly the ADDYs, is the advertising industry's largest and most representative competition, attracting over 40,000 entries every year in local AAF Chapter competitions. 1. Concurrently, all across the country, local entrants vie to win ADDY Awards - recognition as the very best in their markets. AAF-Houston's 2018-2019 ADDY Calendar: AAF-Houston Awards Call for Entries: Mid-October 2018. First/Regular Entry Deadline: December 1, 2018. Late/Final Entry deadline: January 4, 2019. The 57th Awards Gala will be held at the Hyatt Regency Houston on February 16, 2019. AAF-Houston's Gold and Silver ADDY Winners qualify for the AAF Tenth District Awards competition in Dallas. 2. At the second tier, local ADDY winners compete against winners from other local clubs in one of 15 district competitions. District winners receive their awards at the annual AAF Tenth District convention held in April. AAF Tenth District Winners qualify for the AAF National Awards competition in Washington, D.C.
3. District ADDY winners are then forwarded to the third tier, the national stage of the American Advertising Awards. National winners receive their awards at the AAF National Convention held in June. For more information, contact the AAF-Houston Office at adclub@aaf-houston.org/ or 713-237-9999. We are kicking off the New Year with a very special guest at our January luncheon. Get your tickets now to listen to Mayor Sylvester Turner. Purchase HERE! College students from across the region compete to create the best ad campaign. Apply for this year’s conference! Please join us for the 28th Annual Houston Media Classic to benefit the Houston Dream Fund, Houston Food Bank, and the Advertising Education Foundation Houston on Thursday, October 25, 2018. We will have a great day of golf at the beautiful Wildcat Golf Club in Houston. The event will include a Texas Scramble, box lunch, and awards dinner reception following golf. PIGC, AAF-H, Ad 2 Houston and The Printing Museum present, The 10th Anniversary of Oktoberfest. Join us as we celebrate Oktoberfest with beer and brats at St. Arnolds Brewery. Grab your lederhosen and brush up on the Chicken Dance and Beer Barrel Polka. It will be Wunderbar! Get all the details for guests, sponsors and to regiter at www.pigulfocast.com, or give us a call at 713.522.2046. If you had to guess, what % of the audience will be agency v brand v other? Houston today is where all of America is going to be in about 25 years. Take advantage of our lower membership fees for 2018-2019 and enjoy a year of Houstonia Magazine! Jackie Dryden, Savage Brands, to be inducted into the Southwest Advertising Hall of Fame Class of 2018. With so many new social networks springing up these days, it can often be hard to know where to spend your time for the greatest return on investment. Level up your career by learning the best practices to improve your LinkedIn profile to attract potential recruiters or to source prospective clients. A big thank you to Simon Printing / Marketing Solutions for your generous sponsorship. Impact Awards to celebrate its 40th year as a school in the College of Liberal Arts and Social Sciences at UH and the 10th anniversary of its Jack J. Valenti naming. For more information and to purchase tickets, visit https://www.valentievents.com/. This annual advertising convention is not to be missed by professional members of the American Advertising Federation in the Tenth District. It is held simultaneously with the District-level National Student Advertising Competition for collegiate AAF Tenth District chapter members. The National Student Advertising Competition (NSAC) is an annual competition administered by the American Advertising Federation (AAF) for college chapters across the country. Each year, college teams are – presented with an advertising and marketing challenge provided by the sponsor for the competition. The sponsor for the 2018 competition is Ocean Spray. Come cheer Houston's own UH Valenti School ad team to another victory. Join us for our annual Membership Drive hosted at Saint Arnold's Brewery, March 27, from 6-9 PM. There will be fun swag, food and drinks on us! Come learn how to get the best rates for AAF-H's 2018-2019 membership. Join us for the American Advertising Awards, as we recognize and reward the creative spirit of excellence in the art of advertising. The American Advertising Awards, formerly the ADDYs, is the advertising industry's largest and most representative competition, attracting over 40,000 entries every year in local AAF Club (Ad Club) competitions. Click here to purchase Gala Tickets! Ad 2 Corporate Cupid- Attract the company you love at Corporate Cupid! Corporate Cupid is your chance to gain valuable industry insights that will help you land that job you have your heart set on. Come join us at The Hess Club for our February 21st Luncheon including guest speaker, Eddie Shekari, President of Versa Creative. The American Advertising Federation-Houston will honor E.D. (Ed) Wulfe with its AAF-Houston Trailblazer Award on Thursday, February 8, 2018. The 20th annual AAF-Houston Trailblazer Gala evening will feature a cocktail reception, silent and art auctions that include one-of-a-kind fine art pieces created by members of the advertising and design community, special award presentation, and seated dinner. All proceeds benefit educational initiatives. *Park on the 3rd floor of garage and bring parking pass to get stamped. Thank you for your interest in serving on the AAF-Houston Board of Directors. Please complete the brief form below. If you have any questions, contact us. Please join us for the 27th Annual Houston Media Classic to benefit the Houston Dream Fund, Houston Food Bank and Advertising Education Foundation Houston on Thursday, October 26, 2017. We will have a great day of golf at the beautiful Wildcat Golf Club in Houston, TX. The event will include a Texas Scramble, box lunch and awards dinner reception following golf. Reconnect with media friends from the past at this special HMC Reunion presented by Clear Channel Outdoor. Your individual $25 ticket gets you in the door with one raffle ticket and one drink coupon. Rub shoulders with media greats who are part of HMC history. Whether you are still happily working in the industry, left the market for that next big promotion or retired after years of hard work you will want to join us for this special event.